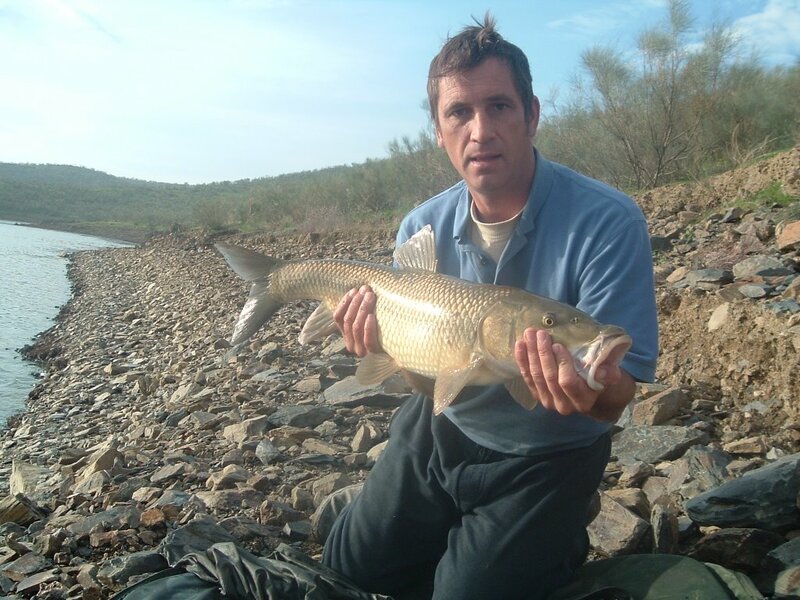 Pleasure and Specimen Carp, Barbel and Pike fishing on the River Guadiana, Extremadura Spain. Barbel fishing season Winter 2006 5 short sessions into the new winter Barbel season (30th November)produced 18 fish with almost a double figure Barbel every day. The day in question only produced fish to 9lb 12oz, in total 5 double figure fish were landed, with the biggest weighing in at only 13lb. With no guests wanting to brave the winter weather here, notice all the jumpers, as per photos above the 5 Barbel sessions, we also managed to get in 8 carp sessions. As you see from the photos below, we had an arm wrenching time. 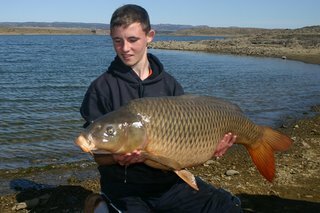 These Carp are animals, most have never seen a hook and when they do, you know about it!! This venue is where several top carp anglers have predicted a new European record will come from, already this year it has produced several fish around the 70lb mark. This is by NO means an 'easy water' but our guests have had up to 11 runs in ONE session and fish we are catching average around 25lb. 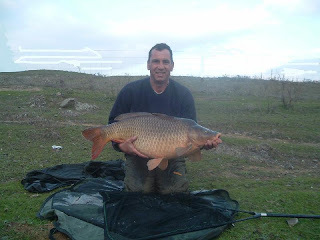 The Orellana Carp provide great sport, not only for the serious Carp angler but pleasure Carp anglers alike, they fight like tigers and have almost certainly never been caught beforeand you know about it!!. The Carp here are WILD, NATURAL and all MUSCLE, these Carp ARE Animals. October 2006 produced many fish for the few guests we had during this period. Young James (15)travelled from UK to Visit his Father who treated him to 2 days guided fishing with us. 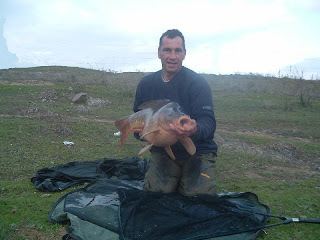 He took several fish improving his PB of 10lb with a 17, 23, 27 and this 32lb. Biggest fish of the month went to Dave Hart, banking this 41lb'er, the group of 3 took eight other 20lb+ fish in the total of 24 runs in the 5 days they fished. 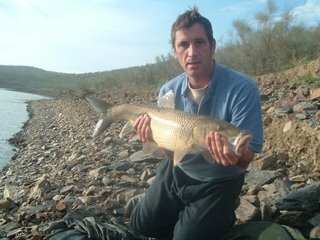 "Originally traveled to fish the Ebro, but decided that we would travel the odd 600miles to fish a new fishery. What a great decision! 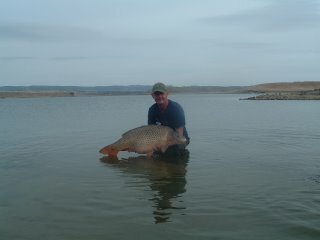 A completely untapped pristine coarse fishery, pristine environment and a real chance of a monster. Craig is just starting to get it sorted out (October 2005). I would bet that the new record common will come to one of Craig's rods over the next couple of years the potential is absolutely untouched. There are no foreign anglers here at the moment and the Spanish approach for Carp on these waters is still at the boiled spuds and rod bells stage. (they still catch). Its a really rich environment and the carp are heavily built naturally. 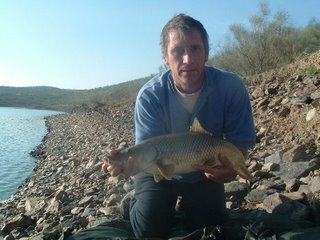 Not as prolific as Canada or some of the stocked lakes I have fished on thecontinent but the fishing seems to be neatly divided into a decent number of large carp on one water and a huge quantity of general coarse fish on the other waters. 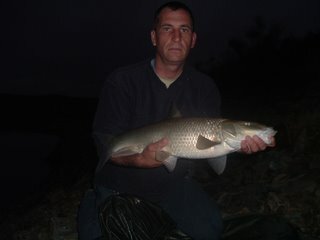 It is a bite a chuck on one of the waters with Barbel taking deadbaits and half a dozen runs a day on the big fish lakes. I stress again this is a real natural fishery that is still maturing, if the environment that you fish in is important to you then you will not beat this area for its cleaness and must be one of the least spoilt environments in Europe. Chuck in the fact that dinner is 7 euros for 3 courses with wine and its also bloody reasonable. I shall return!!!!!!! Pete." thanks for a fantastic time , you made for very special time for both james and I.
James is absoutely made up and is already talking about visiting ou all next year ..
Extrema Fishing Spain S.L is a fully legal and registered company with over 9 years experience in the guided fishing holiday business.